This year, NFT has provided 14 tower cranes for the construction of Reem Mall. NFT, one of the largest tower crane suppliers in the region and the only dealer for Potain in the Middle East, has immensely contributed to and participated in reshaping the skyline of the UAE capital. Abu Dhabi is where NFT opened its headquarters in the early 1990s, with its first mega project in the capital having been a palace in 1994 followed by the Marina Mall in 1999. Over the ensuing years, NFT continued to be part of the growth and evolution of Abu Dhabi by supplying to construction projects in various sectors, Nagham Al Zahlawi, strategy and marketing manager, tells Gulf Construction. 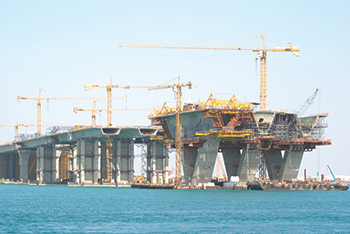 NFT worked on the bridge that connects Saadiyat Island to the capital. “Many projects have been completed and several different tower crane ranges deployed and later replaced with more innovative models. Roads have been constructed and the sea reclaimed to grow the capital. But one thing remains constant and that is NFT continuous service to the capital, and having its tower cranes stand tall on Abu Dhabi’s skyline,” Al Zahlawi says. Among the many projects NFT has supplied to in recent years are schools (Abu Dhabi Future Schools Program Phase), industrial projects (Baraka Nuclear Power Plant), transportation hubs (Khalifa Port), hospitals (NMC Speciality Hospital, Khalifa City A), airports (Abu Dhabi International – Midfield Airport), theme parks (at Yas island), residential communities (Mamsha Al Saadiyat), hotels (Rixos Hotel, Saadiyat Island) and malls – the latest of which is the Reem Mall, where NFT has this year installed 14 tower cranes. Highlighting some of the company’s landmark projects over the years, Al Zahlawi says, NFT worked with ACC in 2000, to build the Sheraton hotel (now the new Novotel). In 2008, the company helped in the construction of what is now known as Mariyah Island and Reem Island with Chain Link Reem Island and with Group 3 Engineers. “Zone-E1 villas, Island – Zone-D were constructed by National Project and Construction (NPC) using four MC 205 hammerhead tower cranes from NFT,” she reminisces. 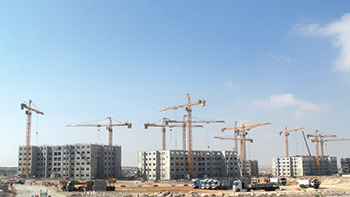 NFT placed 60 tower cranes on a housing project for Adnoc in Abu Dhabi in 2011. Also in 2008, two major malls were built – the Abu Dhabi Mall and Dalma Mall – with NFT cranes as was the prestigious Sorbonne University during the same year. In early 2009, NFT installed seven tower cranes for the Capital Plaza project followed by the Central Market mall (now called WTC Abu Dhabi). That same year, the Abu Dhabi Financial Centre (ADFC) project by Oger Abu Dhabi saw completion, thanks to an MD285B, an MD365B L16 and three MD 600 cranes. The Masdar City project – where brand new Potain tower cranes were installed – was launched that same year. “In 2010, the pioneering Mariyah Island development was the multi-specialty hospital, Cleveland clinic. The 364-bed luxury hospital, part of the Cleveland Clinic Foundation, had 11 tower cranes on hire at the site to ensure the timely delivery of the project. That same year, NFT helped build Adnoc’s headquarters in the city, in addition to beginning negotiations for Yas Island construction,” Al Zahlawi says. In 2011, NFT contributed to the completion of the Ferrari Experience on Yas Island. Also in the same year, the company hit headlines by placing a whopping 60 tower cranes on a mega project in Ruwais for housing Adnoc employees in the Western Area of Abu Dhabi, she adds. Not so far away from its head office, NFT started work on what is now Saadiyat Island, by helping build the bridge to connect the city to this new area. 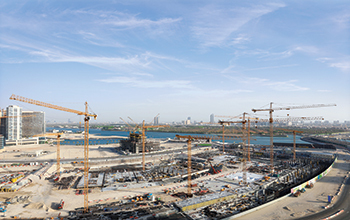 The most iconic project to be built in this new part of Abu Dhabi remains the Louvre Museum, where nine tower cranes of the type MD 345, MD 365 B and a self-erecting tower crane type GTMR 386A stood tall for two years. Abu Dhabi continues to be a strategic location for NFT. “From Abu Dhabi, NFT ships to any destination worldwide. The company also has a massive yard in Al Dhafra, home to its incomparable fleet of 2,000 tower cranes and 500 construction hoists,” Al Zahlawi concludes.